I gave a parish mission and the folks said this was the best of my three talks. 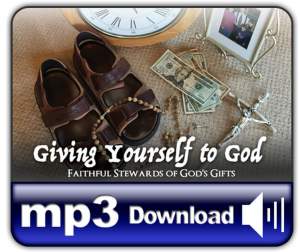 You can now purchase it on MP3. CD audio disk coming soon. Aren’t we all tired of old liturgies from the first centuries? Shouldn’t we update our church services? The time has come to compete with Hollywood and the new generation! Announcing! Here is the NEW model of church — for the new generation who’s tired of the same old, same old, same old…. This Sunday, join the NEW form of worship. Join an Evangelical mega-church near you! Oh, and don’t forget to put a double shot in your cappachino when you arrive Sunday morning. You will need the extra boost to get in the groove! Help the Spirit, you know. And yes, we do have cup holders for our theatre-styled seats. Welcome! We love, love, love you and — thanks for choosing our church!! It’s much more entertaining here than where you USED to go! This is a bit of irony that pokes a bit of fun at the contemporary “worship scene” in many churches today. But the last video is simple and straightforward — the liturgy of the early Church, the Church of saints and martyrs. If that is not enough, look a bit deeper and see how you can get your own mega-church! Bring them in! Compared to Sunday morning in 155 AD! The following was written by St. Justin Martyr to explain to the Emperor what happened every Sunday in EVERY church in the Roman Empire. It is one of the passages that made me a Catholic and made Janet and I fall in love with the Catholic Church and the Mass. We are in continuity with historical Christianity and and members of the One, Holy, Catholic, and Apostolic Church. And this is where We ARE going on Sunday!